I was never a jewelry kind of girl (before), so that is perhaps why I’ve never sat down to create that kind of stuff to wear. It was just not interesting to me, because I didn’t need any of that. Earrings makes my ears itch and I’m not good at matching a necklace with what I will be wearing so I don’t. I just usually skip that part of dressing. But maybe all that will change now? I don’t know yet, though I now have found yet another hobby that I love! Look at this photo (courtesy of my brother) and take a wild guess what my new hobby is? 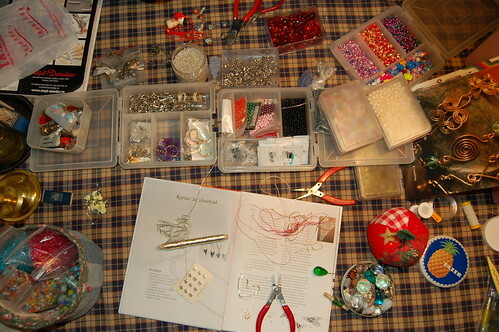 I’ve read several books about beading and I love how beautiful and inspiring they all are. But the one that got me curious is called Smycken du kan g?ra sj?lv and is written by Annika Larsson. It’s nothing special about it, except those hearts… They are fabulous! 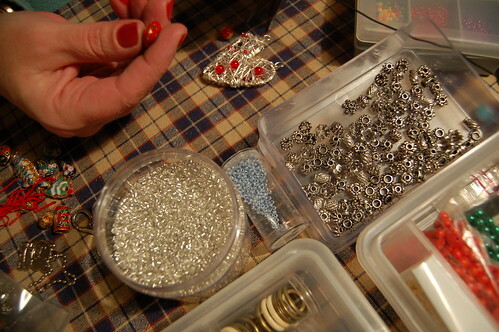 We have been sitting for several evenings and creating mostly necklaces but also some bracelets. I haven’t taken proper photos of my creations yet because I’ve been busy a couple of nights creating them, sitting by the kitchen table. I have used beads in many projects before, like on my art dolls, but like I said, this material now has a new meaning to me. Jewelery! 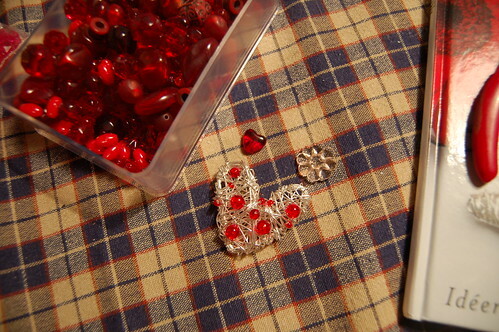 The first thing I made was this heart – all wrapped in gorgeous red beads! They are both fun and easy to make. After this one I couldn’t stop and continued to make more necklaces in other colors. And as easy as that I was hooked! I don’t believe people who say “stick to one thing until you know it”, hehe. I don’t know nada and I’m having so much fun in the process of discovering new materials and techniques. So I say, craft on everybody! Is there something you have wanted to try, like, for ever? I have a long list, and it is growing by the minute! This entry was posted in Crafts and tagged beads, jewelry. Bookmark the permalink. Hah, you caught the bug! I’m the same way, I hardly ever know what jewelry I’m wearing or if I’m even wearing any. My mother-in-law has been working with beads since she started making beaded roses with her mother during the Depression in the 30’s and she makes most of her jewelry. Every year when we go on vacation together she visits this one jewelery supply shop. Until this year I have always been able to resist picking up yet another craft, but this year I got hooked. I now have jars of beads and drawers of tools and my dear relatives keep giving me more. It is a useful skill, though. You’ll never have to buy another present for your friends again, just more beads to make them a special something. I love your heart. It is very sparkly, shiny and cool. Hm, maybe it could be modified into earrings? . 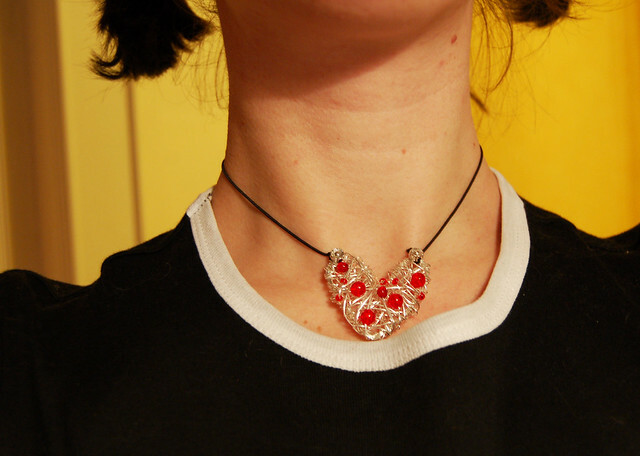 . .
beautiful heart necklace. My mom makes jewerly and she loves it. Its really addictive. If you didnt read the reply on my blog comment, thanks for the tutorial on book binding! I knew you would have one…I will show you the first one I make! I probably have more beads than I know what to do with, but I love each and every one of them, and love to bead in any way I can!! Love, love, love the heart pendants! SO CUTE!!! 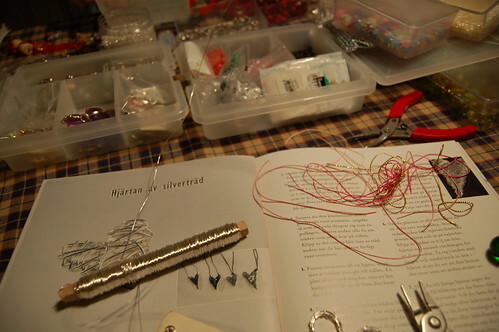 I actually have wanted to try doing some beading–there are so many gorgeous bead books here in Japan. That’s adorable! I think you could make a whole jewelry set that way — how about earrings, like Simone said… AND a bracelet AND a ring? Welcome to the ranks of Beady-Eyed Women! A coworker of mine was really into beading and made really interesting pieces of jewelry. She showed me different techniques in magazines. She invited me over once to bead with her and was kind enough to let me use her supplies, it was fun but I couldn’t get into it as a hobby. 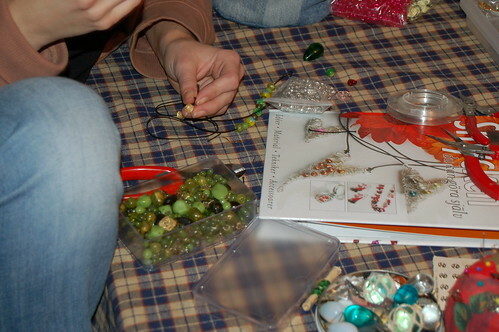 It felt time consuming and I was all thumbs when it came to handling the delicate glass beads. I love what people produce from this craft though, it’s gorgeous! beautiful! I love the silver wire heart shaped, very smart ideas..
That heart is just so cool! Nice work. There are lots of things I want to try, I only need time for it! *^v^* Lovely necklace, great job!